28 • April 2017 www.concreteproducts.com Two leading developers of carbon dioxide-based processes for concrete production, curing and portland cement substitution or optimization are among four entities advancing to Innovative Carbon Use, round two of Emissions Reduction Alberta's (ERA) $35 million international ERA Grand Challenge. Solidia Technologies, Piscataway, N.J., and CarbonCure Technol- ogies, Halifax, N.S., will receive up to $3 million to accelerate and expand their low-carbon solutions for concrete products, slabs and structures over the next two years. The former integrates namesake cement and concrete production plus CO 2 -activated curing for pri- marily precast applications, ultimately reducing the carbon factor in finished concrete by up to 70 percent compared to conventional portland cement alternatives. "We make a sustainable innovation smart business for one of the world's largest industries, and are very grateful to Emissions Reduction Alberta for recognizing that our technology is an engine for growth and a smart investment opportunity," says Solidia Chief Commercial Officer Bo Boylan. "ERA's ongoing support is critical as we work to help our customers roll initial Solidia Concrete precast products out to the market." CarbonCure specializes in CO 2 injection methods for ready mixed and manufactured concrete production. Among producers behind its 40-plus system installations is Calgary's Burnco Rock Products, which adopted the technology in 2016 and will soon be joined by other Alberta ready mixed producers participating in the ERA pro- gram. "CarbonCure helps us serve our communities and stakeholders with sustainable construction innovations," affirms Burnco CEO Mike Powell. 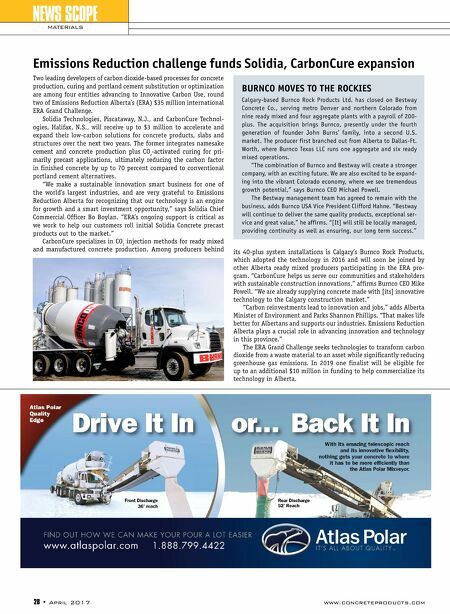 "We are already supplying concrete made with [its] innovative technology to the Calgary construction market." "Carbon reinvestments lead to innovation and jobs," adds Alberta Minister of Environment and Parks Shannon Phillips. "That makes life better for Albertans and supports our industries. Emissions Reduction Alberta plays a crucial role in advancing innovation and technology in this province." The ERA Grand Challenge seeks technologies to transform carbon dioxide from a waste material to an asset while significantly reducing greenhouse gas emissions. In 2019 one finalist will be eligible for up to an additional $10 million in funding to help commercialize its technology in Alberta. NEWS SCOPE MATERIALS Emissions Reduction challenge funds Solidia, CarbonCure expansion BURNCO MOVES TO THE ROCKIES Calgary-based Burnco Rock Products Ltd. has closed on Bestway Concrete Co., serving metro Denver and northern Colorado from nine ready mixed and four aggregate plants with a payroll of 200- plus. The acquisition brings Burnco, presently under the fourth generation of founder John Burns' family, into a second U.S. market. The producer first branched out from Alberta to Dallas-Ft. Worth, where Burnco Texas LLC runs one aggregate and six ready mixed operations. 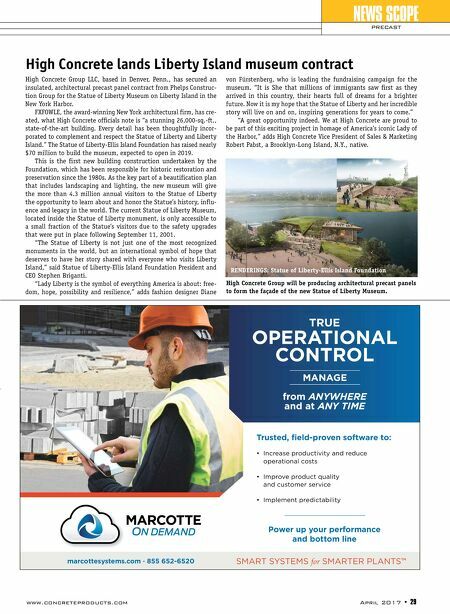 "The combination of Burnco and Bestway will create a stronger company, with an exciting future. We are also excited to be expand- ing into the vibrant Colorado economy, where we see tremendous growth potential," says Burnco CEO Michael Powell. The Bestway management team has agreed to remain with the business, adds Burnco USA Vice President Clifford Hahne. "Bestway will continue to deliver the same quality products, exceptional ser- vice and great value," he affirms. "[It] will still be locally managed, providing continuity as well as ensuring, our long term success."